Using an ab roller could help you get a solid ab workout. That weird contraption that looks like a tricycle wheel with handles? That's an ab roller. And while it might look like child's play, it's actually meant to facilitate ab contraction to help sculpt a svelter stomach. Before you grab hold and go for a ride, know what you're getting yourself into. In the case of an ab roller, you'll need to execute the exercise perfectly to get any sort of benefit. Lay a mat on the floor. If you have sore knees, fold the mat in half for double the protection. Kneel on the mat with the ab wheel in front of you. Grasp the handles for the ab wheel as it rests in front of your knees. Inhale and as you exhale, roll the wheel out and away from your body while your knees stay firmly planted on your mat. Continue rolling outward until your arms extend past your head and are parallel with the floor. The position should be similar to a modified knee plank, with your abs still off the floor. Concentrate on keeping a flat -- not hunched -- back through the exercise. Inhale and roll your arms and the wheel back in toward your body. Complete a repetition when you come back to a kneeling position with the wheel in front of your knee. Repeat the exercise eight to 12 times to complete a set. If rolling all the way out is too difficult, roll only halfway, or until your hands reach the top of your head, instead of extending your arms completely. You can't spot reduce any part of your body. If you're looking for tighter abs, mix strength-training measures, such as the ab wheel, with cardio exercise to help burn fat and total-body training to help build muscle. Add a healthy diet and you'll have even better success. If the ab wheel is too difficult or too painful to use, try another ab exercise. 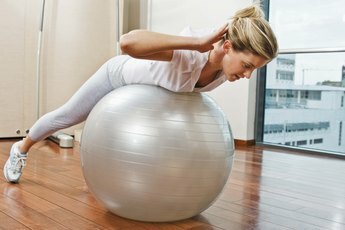 An American Council on Exercise study found that the ab roller was only marginally more effective than the basic crunch and that other exercises -- such as the bicycle and the exercise ball crunch -- are more effective overall. As an added bonus, they also won't be so hard on your knees. How Often Should You Do the Ab Roller?